Government of India has recently launched a facility which allows citizens of India to store digital copy of there documents online for free. This facility is unlike the storage facility provided by Dropbox or Google Drive as it is focused on securing and creating a copy of important documents like SSC Certificate, Driver's License, PAN Card, Aadhar Card and other online. Unlike the storage service provided by private players this database is maintained by the Central Government itself. Citizens of India can access and store their documents online by visiting http://digitallocker.gov.in or http://elocker.gov.in. In order to use the service you have to register for a free account at the above portal. To do visit any of the above links and click Signup to get started. Your Aadhar Card and Mobile Number are the prerequisites to register at the site. After clicking signup button, a One Time Password will be sent by Aadhaar department to the mobile number and email-id registered with UIDAI. 1. Digital Locker is linked to Aadhar Number for each resident and it provides 10MB of free to securely store Resident documents. Space will eventually be increased to 1GB. 2. These documents can be shared with any Requester Agency or department without the need to submit physical copy of the document. 3. esign service will allow you to digitally sign the documents online without the use of dongle. 4. You can download your e-aadhaar copy online. 5. You can see the list of issuers who have issued e-documents to residents of India and also see the list of requesters or departments who have accessed your documents online. 6. This facility will also allow any Government department to issue e-documents to you at your digital locker online. You can upload files only in the pdf, jpg, jpeg, png, bmp and gif format types and the file size cannot exceed 1MB. Once the document is uploaded you can share the document with a recipient by clicking on the Share button. You need to enter the e-mail id of the recipient and he will receive the URI link of the document with sender name and Aadhaar number. The recipient can access the document using the URI link provided in the email. Digital Locker service has been introduced to tackle the following challenges present in the Government departments. 1. Government departments request for proof of documents for various services which increases the use of physical documents which have to be then verified for authenticity. This facility aims to minimize the use of physical documents and ease the process of verification. 2. This service will secure access to Govt. issued documents and will reduce administrative overhead. These documents can be accessed by citizens through a web portal and mobile application for residents. 3. These documents can be accessed anytime and anywhere. The system will have open and inter-operable standard based architecture. 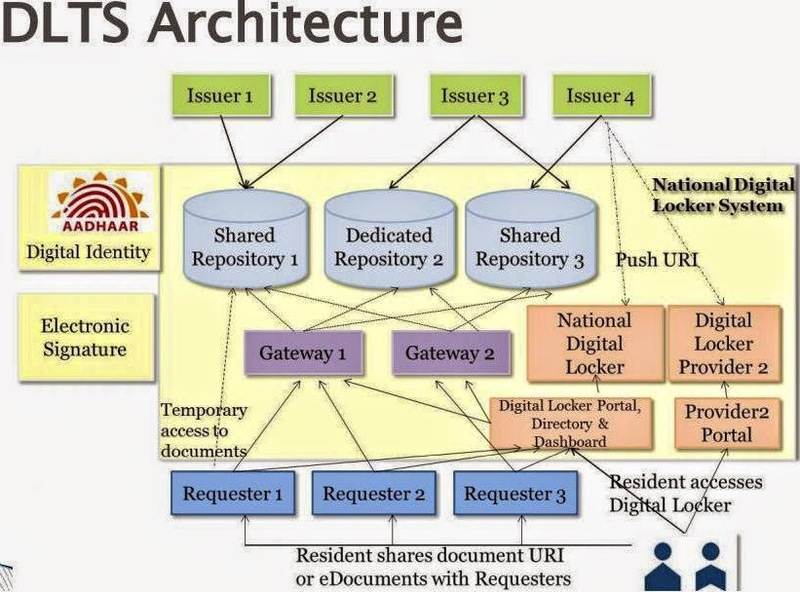 Architecture of Digital Locker with various Stakeholders and Components can be seen below. Have you registered for the service, What is your opinion about it, Do let us know in the comments section below.